Proposed helipad site, on the southwestern corner of the GW Hospital roof. Image by the author. For decades, the only DC hospital with a Level I trauma center and a helipad has been Washington Hospital Center. The George Washington University Hospital wants to change that and add a helipad, but it requires DC Council legislation to amend a 1987 law which prohibits helipads in residential areas. Right now, the Council is looking to the Foggy Bottom/West End Advisory Neighborhood Commission (ANC 2A) for input on the proposed helipad. Here's why I’ll be voting yes. Patients with traumatic injuries are frequently taken to hospitals by helicopter, as their injuries need to be treated quickly. But Washington Hospital Center is the only hospital in the District that can accept them, as it has both a helipad and six beds for trauma patients. Other hospitals in the District, including Sibley and Georgetown, have helipads, but are not Level I trauma centers. As a Level I trauma center, the most specialized of all trauma center designations, GW Hospital is able to provide comprehensive care for all aspects of trauma injuries. 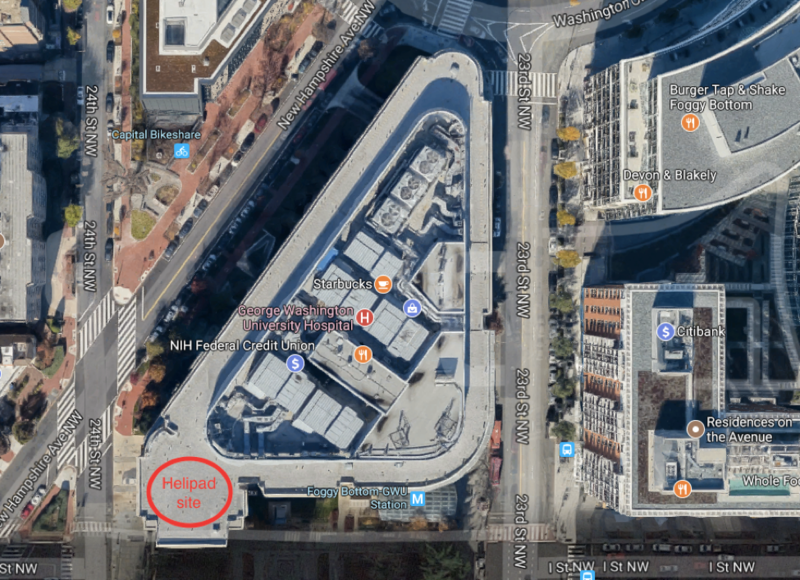 Seeking to meet that unaddressed need from trauma patients arriving by helicopter, the hospital, located in Foggy Bottom, has decided to ask the District Council for permission for a helipad. The landing pad will be located on the southwestern portion of the hospital building, by the intersection of 24th and I streets NW. However, GW University Hospital can’t currently add a helipad because of the Helicopter Landing Pad Public Nuisance Act in 1987, which prohibits helicopters in residential areas. Some neighbors are opposed to the helipad, expressing concerns about safety issues from helicopters flying so close to their homes. The main concern, particularly in the Foggy Bottom Historic District, centers around increased noise that may occur due to helicopter traffic. They’re asking the ANC and Council to not support an amendment to the law. Helicopters allow for quicker transport of patients, which will save lives. Earlier this year, Representative Steve Scalise, who along with three others was wounded during a practice for the Congressional Baseball Game in Alexandria, was airlifted by helicopter to Washington Hospital Center. While things are looking better for Representative Scalise, the next time a tragedy occurs, Washington Hospital Center might not be able to handle all critical patients. The nightmare scenario - a mass shooting during rush hour - would make it extremely difficult to transport all patients by ambulance to receive the care they need. When every second counts, having more than one highly capable, Level I trauma center with a helipad in the District will undoubtedly save lives. Despite neighbors’ concerns about the safety of helicopters using the helipad, pilots within restricted airspace are subject to stricter vetting by the federal government, and the safety record of helicopters in the District backs this up. Additionally, due to the hospital’s location within the White House’s no-fly zone, most helicopters will arrive from or depart from the north or west, so they will not even fly over the eastern portion of the neighborhood where many homes are located. In addition, the helicopters may actually reduce noise around the hospital. A noise study conducted between March 30 to April 5 tested the fly-in routes routes. According to data provided by the hospital, the helicopter produced an outside noise level of 85 decibels. That’s not nothing, but it’s way below the 110 decibel level of ambulances the helicopters might replace. The hospital estimates that the helipad will be used about twice a week and nearly all will occur during the day when noise is not a concern – and noise will last an average of 90 seconds as the helicopter takes off or lands. Other concerns are with the vibration potential from the helicopters, but the study didn’t detect issues with vibration. In any case, heavy-duty trucks and Metrorail cause heavier vibration on a daily basis than small, medical helicopters. Because of the feedback we’ve received from neighbors, several ANC 2A commissioners, including GGWash contributor Patrick Kennedy, have worked with GW University Hospital to find a draft agreement that spells out flight numbers, hours, and a mediation process. Among other requirements, the agreement caps the number of flights that originate or depart at GW University Hospital at 175 per year, requires pilots to “fly neighborly,” mandates that the hospital notify ANC 2A within 72 hours about any flight that occurs between 11 pm and 5:59 am, and limits the percentage of flights that can occur from the building during these late hours to 25 percent of all total flights. The agreement also provides mechanisms for resolving issues surrounding noise, by way of requiring the hospital to maintain a helipad complaint hotline, provide semi-annual reports to ANC 2A during the first few years of the helipad’s operation, and requiring hospital representatives to meet with the ANC if flights exceed the numbers outlined in the agreement. The Department of Health can review the flights if no resolution is reached between the ANC and the hospital in these mediation meetings. Notably, mass casualty events occurring in DC, Virginia, Maryland, Delaware, and West Virginia are exempted from the flight cap, as are helipad landing requests made by federal agencies. At a special meeting on September 7th, ANC 2A voted 5-1-1, with one recusal, to make minor changes to the draft agreement with the hospital to establish the helipad. On September 19th, we’ll take a second and final vote on the helipad agreement, pending approval by GW Hospital of the amendments made to the agreement. If you live in Foggy Bottom or the West End, please let your commissioner know you support the helipad.